CEDAR RAPIDS, IA – APRIL 13, 2016 – Greg Edwards, the CEO of local cybersecurity firm WatchPoint, is set to appear on the KCRG program, Ethical Perspectives, at 11:00 am on Sunday, April 17th. The title of the program is "Tapping the iPhone". Edwards, a longtime member of the Cedar Rapids business community, was selected for the show to lend his 22 years of cybersecurity expertise on a variety of topics, most notably the recent debate over privacy between Apple and the FBI. Edwards, a serial tech entrepreneur, launched WatchPoint Data in 2015 after selling his former data backup and disaster recovery company, Axis Backup. WatchPoint provides cyber threat alerting and response to small and mid-size businesses across the U.S. While running Axis Backup for the insurance industry, Edwards saw firsthand the rapid increase in damage cyber criminals were doing with debilitating malware which resulted in high cost for vulnerable companies. Between 2012 and 2015, 1 in 5 of Axis Backup’s clients was affected by cybercrime. Edwards realized effective cyber security could save businesses costly downtime and compromised systems. In 2015, Axis Backup was acquired by J2 Global, freeing Greg to create WatchPoint and focus exclusively on cybersecurity. WatchPoint Data was founded in 2015 and is headquartered in downtown Cedar Rapids, IA. 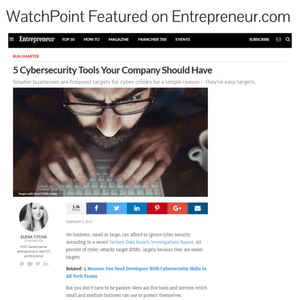 WatchPoint’s endpoint security system is built using the best real-time data capture technology, threat intelligence and analytics, and cybersecurity expertise to detect threats in an organization. Throughout each step in WatchPoint’s threat detection and alerting system, the company provides additional value by utilizing US based cyber security support experts that are ready to act on threats in real-time 24/7/365. Previous Post Tapping the iPhone Next Post Antivirus for CryptoWall – Why Didn’t It Work?